The wooden barrel at Post Office Bay is very likely the Galapagos Islands’ most famous man-made site. It has been in use since the 1700’s, first for whalers and now for tourists. Visitors leave unstamped mail in the ‘post office’ barrel on Floreana Island for hand-delivery by other travelers. They then root through its contents to see if there is any mail they can take home with them to be hand delivered. Until recently, Post Office Bay was only accessible by ship. 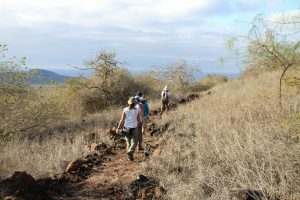 Now, the local community has developed a tourism experience by adapting the trail coming from the highlands of Floreana Island down to Post Office Bay for tourists’ use. We at Destination Ecuador believe that it is critical to ensure that local communities in the Galapagos and throughout Ecuador benefit from tourism. Working with locals to develop and support tourism offerings is an important way to do that. This new trail also allows travelers visiting Floreana Island to dig deeper into the Island’s culture and history. Our full-day activity begins at the entrance of Cerro Allieri, one of the highest spots on Floreana Island. Guests will walk approximately 2.5 hours by the old road to Post Office Bay. The hike affords the opportunity to spot myriad birds including Mediterranean finches, Canary Maria, flycatchers, and more. On arrival, guests can visit the post office to leave and take cards, as well as investigate the nearby ancient lava tube. This is followed by a refreshing dip in the ocean for some snorkeling. Swimmers might spot sharks, rays, turtles, and sea lions in the water, and see Galapagos’ interesting vegetation on the land. The return to Puerto Velasco is made via boat, where travelers can retire to the tranquil Floreana Lava Lodge to relax. 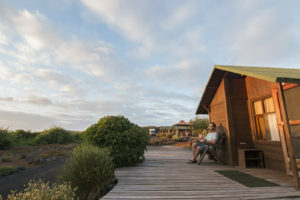 We would love to show you this special part of the Galapagos Islands. Contact us to learn more or to make this full-day activity a part of your Galapagos adventure!